If you’re looking for a pair of versatile binoculars that can go toe-to-toe with much more expensive models, the 10×42 Diamondback by Vortex Optics may be just the perfect thing. The small details about this model, as well as the superior optics, make the Diamondback a popular choice for a variety of uses. A little refresher course in optics here: the number 10 in the binocular configuration refers to the power of magnification. The 42 refers to the size of the objective (front) lens. Ideally, you want a combination of magnification and aperture that gives you a large, bright field of view without being too heavy, too unwieldy or too outlandishly expensive. The Diamondback 10×42 won’t disappoint in this regard. 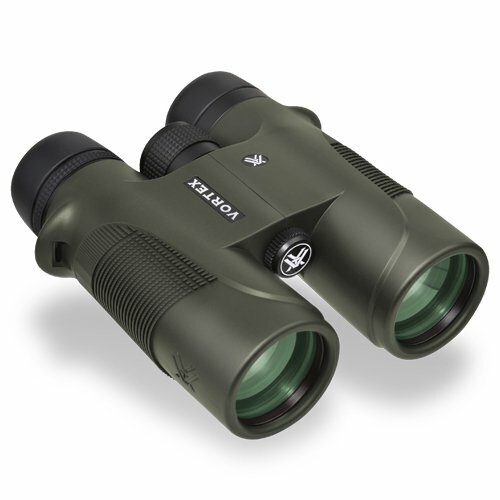 At 24.4 ounces and 6.4 inches, these binoculars will fit in a field coat pocket and easily hold steady in your hand, yet give you great visibility even at dusk and dawn (345 feet at 1,000 yards). 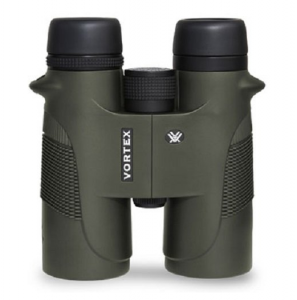 The Vortex Optics Diamondback 10×42 are roof prism binoculars, with phase correction to eliminate interference between different light phases reflected in the prism (known in optics as phase shift). What does this mean for you? Higher resolution and crisper contrast in every image because the fuzziness that can accompany phase shift has been corrected. O-ring seals and argon gas purging keep the Diamondback 10×42 fogproof across a wide range of temperatures. They are waterproof, as well, which makes for a great set of hunting binoculars–you won’t miss a thing in the bush with this model. Waterproofing and fogproofing are essential for birding, too. Don’t let anyone tell you otherwise. Even if you’re birding on a pristine, clear day, changes in temperature and humidity between the house, car and outdoors can cause fogging without a mechanism to prevent it. And of course, some of the world’s best birding takes place in dripping jungle habitat or by the spray of the sea. Most folks will be taking the Diamondback 10X42 out for a full day of activity, so you want a model that’s comfortable and can handle the high use. With their forgiving eye cups, these binoculars will work with or without eyeglasses all day. The rubber outside casing offers a durable, non-slip surface for use with both bare hands and gloves. This is key if you’re going to be hunting in the snow or taking them to the nosebleed seats for some late-season football games up north. The Vortex Diamondback 10X42 Binoculars have a right diopter to adjust for the difference in vision between your two eyes, in addition to the center focus wheel. You can easily mount them on a car window, and they are also tripod adaptable. If you’re comparing brands in binoculars, you’ll find that a lot of companies out there don’t just make binoculars; they make cameras, electronics and even jewelry and home goods. Vortex Optics specializes in sport optics, so you know they are pouring all their resources into a limited number of related products, like binoculars and rifle scopes. This allows them to offer an unconditional lifetime warranty on their products, the Diamondback 10X42 included. Available at under $300, this model is a steal when you compare it to comparable performance in other lines. Known for their customer service and attention to detail, Vortex Optics is rapidly developing legacy customers, to no surprise. If you’re going to take your Diamondback 10X42 Binoculars into the field, you might want to consider a few extras. While this model comes with a molded carrying case and strap, a harness might serve you well over bumpy terrain or climbing your stand. Additionally, a lens cleaning kit will keep your binoculars in tip-top shape, so you can enjoy them for years to come. Overall, there are few drawbacks to the Diamondback. There are still shadows that most binoculars have trouble with when you move them around sharply, but they aren’t a huge deal if you find some sort stabilizer (like a tripod) for them.